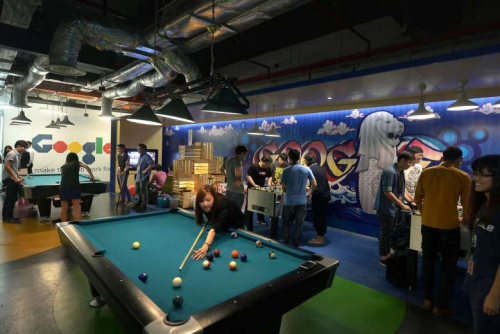 SINGAPORE - Google is the most attractive employer in Singapore, according to the latest "people's choice" survey by recruitment firm Randstad. Google's strong reputation for innovation held a significant appeal to job seekers, said Randstad. Out of the nine criteria used to determine a company's attractiveness score, Google was ranked No 1 in all of them - leading the company to win the Randstad Employer Brand Award in its very first year in the running. The criteria this year include work-life balance, job security, pleasant work atmosphere and career progression. Google beat out last year's winner, local firm Changi Airport Group, which came in a close second, "an encouraging showcase of how local home-grown companies can continue to hold its own weight against global juggernauts when it comes to employer branding," said Randstad. This was also the fourth consecutive year Changi Airport Group was ranked in the top three. In third place was ExxonMobil. Three other sector awards for the most attractive employers were presented with CapitaLand topping the property & real estate category, DBS Bank, the banking & financial services group, and Thermo Fisher Scientific for the life sciences. The Randstad Employer Brand Award, previously known as the Randstad Awards, is presented each year to the most attractive employer in 26 countries after surveying over 160,000 global respondents. The 75 largest companies are selected in each participating country, usually with more than 1,000 employees. In Singapore, over 5,000 employees and job-seekers between the ages of 18-65 were surveyed. In Singapore, over 5,000 employees and job-seekers between the ages of 18-65 were surveyed.